Our trip got off to a great start. We had decided to break our journey overnight at the hotel in the Dubai airport. When we checked in we were upgraded to a suite. Extra space is always welcome but for me the star turn was the massage chair which gave my back and neck a great work out. Just what you need after a longish flight. After a slap up breakfast for my beloved, and fresh fruit for me, in the gi-normous Emirates lounge, we boarded our flight for Melbourne and were upgraded to first class. This trip just gets better and better. My beloved frequently gets upgraded, thanks to his fine array of airline loyalty cards. Our last upgrade together was on an overnight flight from Dubai to Frankfurt where I found myself sitting across the aisle from Rafa Nadal and Uncle Tony. I should add Nadal is smaller and better looking in the flesh than he appears on television, and he has a lovely shy smile. I first tasted first-class travel back in the mid-80s on a business trip to the Far East and, largely due to competition from the Middle-Eastern airlines, it has since much refined its offering. When I first flew with Cathay Pacific I have to confess I surveyed the small cloakroom and concluded if you wanted to join the mile high club you’d both have to be contortionists. Well, no longer! 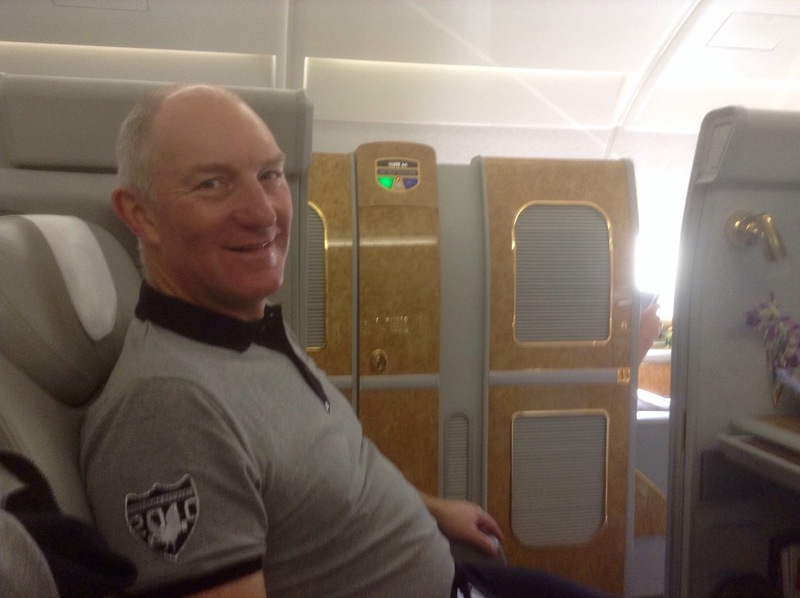 I’m delighted to report that the first class facilities on Emirates include no less than two cloakrooms and two bathrooms for 14 flyers, the latter with a shower and dressing room. I’ve had smaller hotel bathrooms. So did we join? That would be telling! Of course, the real beauty of first-class is SPACE, each seat is a suite. There’s more than enough room for all your bits and pieces, a spacious chair/flat-bed which also provides a variety of in-chair massages, your own bar, snacks, a wide tv screen, WiFi and all the usual bells and whistles you’d expect if you were paying £6,000 (return) for the priviledge. A bit of a bargain since my debut first class flight in 1984 was £2,600. Thank you Emirates, you’ve gotten my birthday trip off onto a fine footing.